I have owned Stumps since the first prototype!! I actually bought the 3rd one he ever made!! I purchased a used model last year and since then, i have slept at every comp! I have just come back from Ga yesterday where I/we won GRAND CHAMP! Got some really good sleep and the combo of the Guru and Stumps is unbeatable! Tell me something about that Stump's Elite 7. 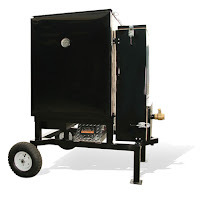 I own a Traeger Executive 125 and love it but I am looking into one of the insulated type smokers. That looks like it might just be the ultimate smoker. Please share all you have on the Stump's. I have tried to find out something about and have come up dry.